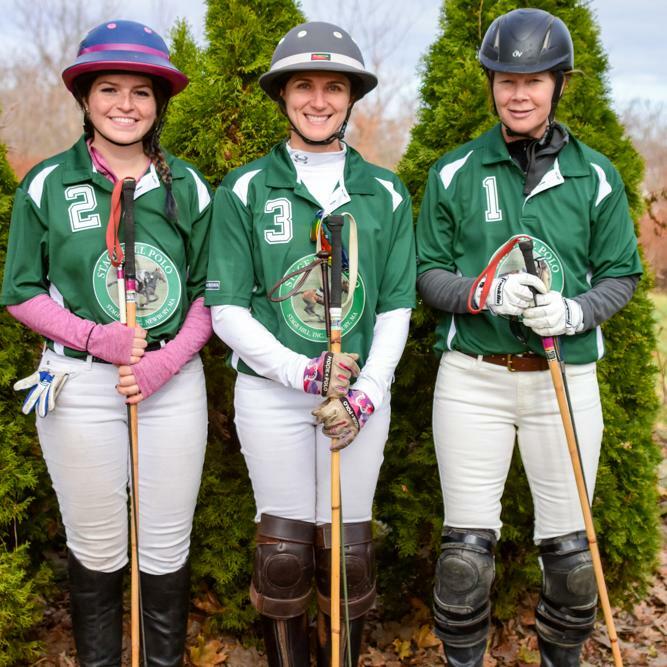 Competitive players from near and far migrated to Portsmouth to strut their stuff in the 6th annual Thanksgiving Arena Polo Tournament on Saturday & Sunday, November 24/25, 2018. Under fair weather conditions, the two-day tournament drew four teams for a friendly rivalry over the holiday weekend, welcoming back milder temperatures to the area. In Saturday's opening rounds of competition, the Stick Chicks defeated the Hard Rockers in Game 1 to advance to Sunday's Final, while Boom-X-Y-Z downed the Kingsmen in Game 2, earning their berth in the Finals. On Sunday, the Kingsmen finished in 3rd place in the Consolation match against the Hard Rockers, and the Stick Chicks came out the 2019 champs over Boom-X-Y-Z in the Final, to take home the Thanksgiving Tourney trophies. Following the matches, in the spirit of the holiday, players and spectators gathered to enjoy some fireside hospitality and revel in the camaraderie of the day. Tournament Photo Album on Newport Polo’s Facebook Fan Page. Best. Season. Ever! Newport Polo is the home of America's first polo club, est. in 1876, and a founding member of the United States Polo Association offering public exhibition matches, polo club member services for grass & arena polo, and polo instruction year-round. The change in seasons launches Newport Polo’s arena polo league, lessons, Intro Clinics, competition chukkers and tournaments for players at all levels to get in the game. High school teammates face-off with regional rivals and Brown U and RWU return for intercollegiate competition. Newport Polo offers weekly polo lessons with open enrollment for new players. Click Here to read & subscribe to this week's brochure with opportunities to play!